The day of the brace removal is exciting for all concerned but it is important to realise that retainers have to be worn in some shape or fashion from the day of brace removal. The great news is that retainers are very easy to wear. At Glasnevin Orthodontics in North Dublin we generally use fixed retainers and ‘Essix’ Vacuum formed retainers. Are very small and discreet and encompass a small piece of wire flush to the backside of the upper and lower front teeth. The Orthodontist customises it to the shape of each individual patient and attaches it to the teeth. Thus they are permanent. Evenso it is crucial that the patient cleans the retainer in a similar fashion to how they brush their teeth. Are clear ‘gum – shield’ like retainers which are invisible and very easily worn. The amount of wear of this retainer depends on the individual’s original malocclusion and Dr Ward will advise on the type of retainer to be worn during your assessment. Note: Retainers fitted in the day of the brace removal are included in the price of the Orthodontic treatment provided at Glasnevin Orthodontics in Dublin. Also, we monitor the retainers for 1 year after the braces are removed – there is NO EXTRA CHARGE for this and are all included in the ONE STANDARD CHARGE. Clean the fixed and removable retainer carefully – you will be shown how to do this on the day your retainers are fitted. 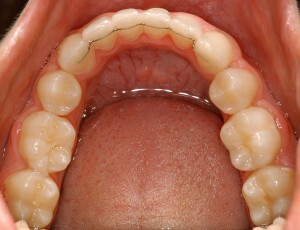 Wear the retainers for as long as you are advised. This is CRITICAL because if retainers are not worn the teeth are not given time to stabilise in their new position and may move. His would be disappointing given that all the hard work has been done.